As regular readers know, I have a small woodworking business that I set up almost four years ago. This year I will again be participating in the Etsy Made-in-Canada show as a vendor along with another 150 local makers. It is a tremendous opportunity to buy handmade products directly from the makers. This show takes place in communities across the country the weekend of September 23 – 24. In some places it is one day. In Ottawa it is a two day show that has added a night market the evening of the 22nd to provide additional options to shop in a less crowded environment. Since not everyone lives in Ottawa or will be able to make it out to the show I’ve picked some of my fellow makers to highlight to my fellow parents and dads. This page includes affiliate links. If you make any purchases from these or other vendors by clicking the links on this page I will receive a commission. It will not increase your purchase price in any way. I love the idea of a hand drawn family portrait and I really like the style of this artist. We never had any chew jewels with any of our kids. I’ve seen these made by various makers over the years since my kids were born and I think they are a great idea. Teething kids chew on everything – Why not elephants? We installed a large chalkboard in our playroom and my older two daughters use it when they are teaching their little sister and / or dolls how to write letters and numbers. They use it for art and to write messages. I didn’t know of anyone making handmade chalkboards when we acquired ours or I would have picked up one of these. I make wood toys and activities for kids and I am a fan of anyone else working in the same space. Wood toys are so classic, long-lasting and don’t result in more plastic in our landfills. I love the simplicity of this play house and the flexibility of the space and pieces that allow kids to use their imaginations to tell stories and build scenarios as they play. 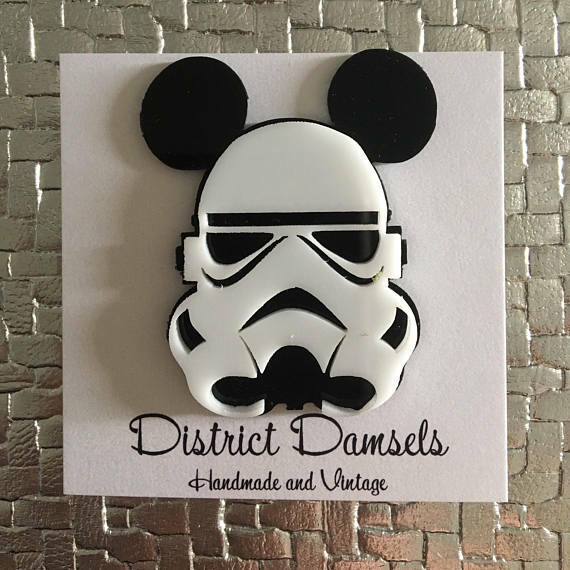 Given that Disney now owns the Star Wars franchise, it is only a matter of time before we see a mickey stormtrooper. Get ahead of the fashion curve with this brooch! We have several dinosaur shirts spread among our daughters’ wardrobes. I love these hand-drawn dinosaur shirts. I picked the T-Rex because really who doesn’t love a cuddly T-Rex? I am thinking about sticking these giant scrabble letters on the wall over our dining room table and getting a pointer stick that I can use to point at the words and tap the wall whenever my kids are doing everything but eating at dinner. I could do it without having to actually use my voice. Actually this is kind of a fantasy of mine. I am a pretty big Tragically Hip fan and if I had some wall space for more art, this Bobcaygeon lyric piece would definitely be on my list. I live in a house full of sisters. The three sisters in my house are powerful and often gang up on me so I have experienced the power of sisterhood. I might set the three of them up with this sisterhood shirt. We are out of the rattle stage of life with our kids. I need to find some friends with a newborn so that I can send over one of these beautiful wood rattles that can be kept and passed on from kid to kid. Welcome to New Patron – STEM Camp! I personally don’t have a strong background in STEM and I have struggled to come up with activities and ways to stimulate my daughters’ interests and encourage them to dive deeper, which is why I am so enthusiastic about this partnership. STEM Camp operates across Ontario, Canada and is expanding into my hometown of Ottawa this summer. The camps will be operating at two locations – Carleton University and Algonquin College. Each week is a different theme featuring STEM activities throughout the week. Some of those activities will be featured here each Wednesday – as my daughters demonstrate how much smarter they are than me! My daughters are excited to be taking part in the CSI and Scooby Doo Mystery Week. They are regularly joining forces with friends to investigate mysteries and they are big fans of Scooby Doo so this camp will give them a leg up in their investigative skills. Other theme weeks at STEM Camp include Minecraft, Planes, Trains and Automobiles and Ocean Adventures. Each theme week runs once in July and then again in August. If you are looking for fun, day camp opportunities where your kids can learn how to identify candy thieves and you live in one of the many southern Ontario communities where STEM Camp is operating this year I encourage you to check them out. You can find all of the details at www.STEMCamp.ca.